The origins of the town are unclear but the original name of the town was Reghinna Maior, in contrast to the neighbouring town, Minori, Reghinna Minor. All places along the coast were formed by alternating conquerors - such as the Etruscans or the Romans. 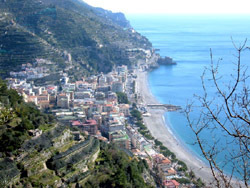 Between 830 and 840, the places of the coast united to form a confederation of Amalfi States. In this Amalfi Sea Republic, the places between Lettere and Tramonti and between Cetara and Positano, along with the island of Capri, were united; and their inhabitants were all called Amalfitaner. At that time, each city retained its own name and administrative autonomy, but had a specific role in this federation. Later it became part of the Principality of Salerno, and then of the Kingdom of Naples, of which it followed the history until the 19th century.